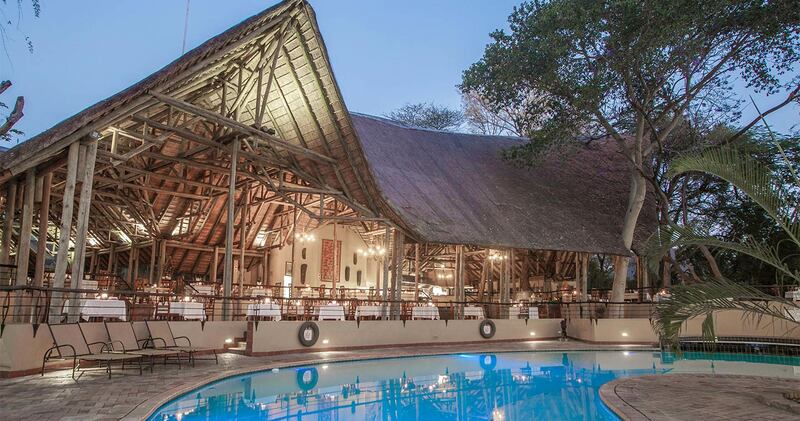 Situated in Kasane, on the beautiful banks of the Chobe River in Botswana, lies Chobe Safari Lodge. Its location provides an excellent opportunity to see elephants, hippos and other wildlife in abundance, or to make exhilarating trips to Victoria Falls and Caprivi. This quite large, but intimate hotel shares borders with the Chobe National Park, as well as practically having the borders of four countries - Namibia, Zambia, Zimbabwe and Botswana - on its doorstep. 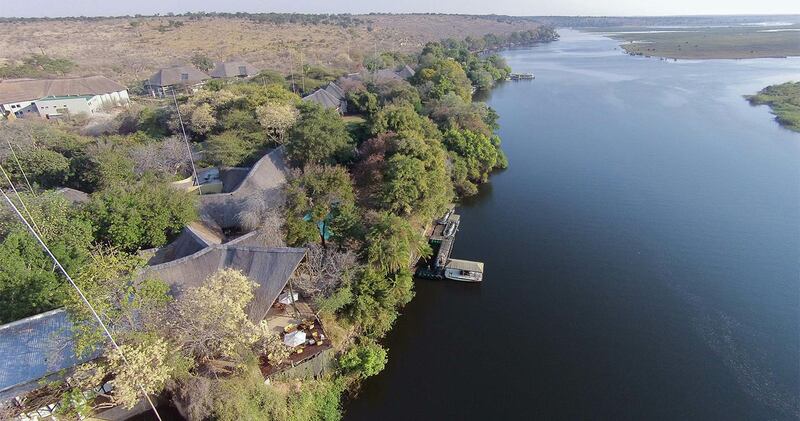 Also on your doorstep, are amazing views of the Chobe River, a great restaurant and bar, spa services (the foot- and-leg massage is a must after a long day) and dinners on the riverboat under star-studded African skies. The town of Kasana is only five minutes away, and it is a fifteen-minute drive to Chobe National Park. Complete with comfortable rooms, an activity center, game drives in the morning and afternoon, half and full day safari excursions, sunset boat cruises, photographic river cruises, scenic flights, Namibian village walks and, not forgetting, a flawless staff, the Chobe Safari Lodge offers an all-round safari escape and great value for money. Rambling along the Chobe River, accommodation at Chobe Safari Lodge consists of 46 individually decorated safari rooms, 22 river rooms with riverside gardens, and eight thatched rondavels. 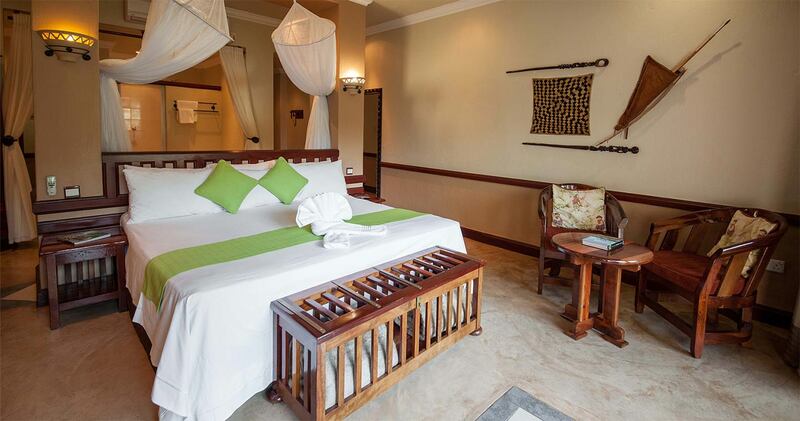 A number of the safari rooms are suitable for families with separate children’s rooms and bunk beds. 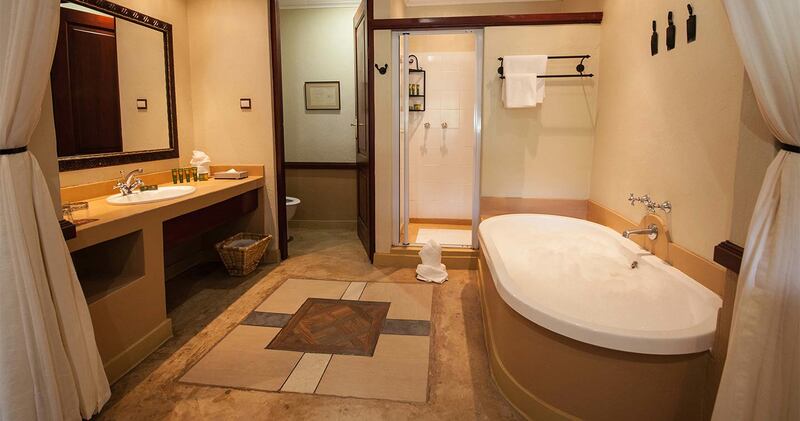 All rooms have en-suite bathrooms, air conditioning (except for the rondavels), fans and selected satellite television. Each room has its own patio providing privacy, so you can enjoy views of the river from the comfort of your own room. Or kick back in the Sedudu Bar, widely renowned as the sundowner spot of the region, as it overlooks the natural splendor of the river and floodplains. Nothing beats gazing at amazingly coloured skies with a freshly-made cocktail in your hand. 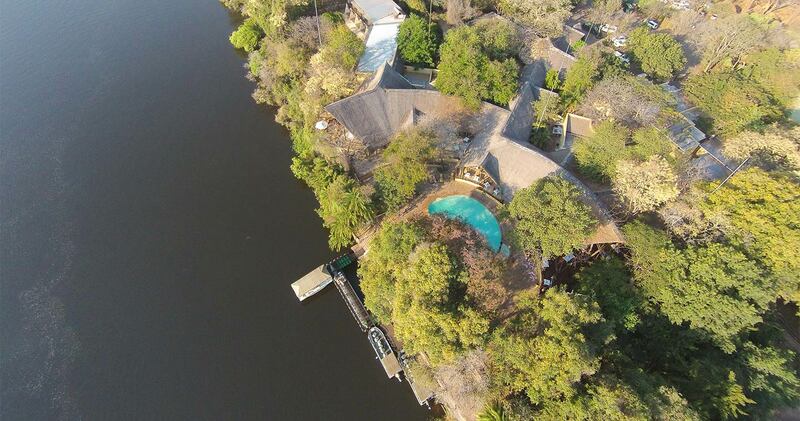 The main lodge is centred round an elevated and expansive thatched open-sided dining deck that overlooks the swimming pool and, slightly further on, the Chobe River. The restaurant serves the indigenous and rich flavours of Africa (don’t leave without relishing your own stir-fry). The choices for breakfast are almost overwhelming (English or Continental), a light lunch is available as à la carte or buffet. Scrumptious, mouth-watering buffet dinners offer a wide variety of meals from exotic game meats, roasts, barbecues, stir-fries, Indian cuisine, or vegetarian dishes. Along with many species of big game, Chobe National Park boasts the largest concentration of elephants in Africa. And just like the food, all the activities offered at the Chobe Safari Lodge are a little staggering. The game drives and boat cruises offer a formidable opportunity to witness amazing elephant interaction and other wildlife sightings. Due to its great location, this lodge is also the starting point for many other activities, such as game-viewing river cruises, local village visits or day trips to Victoria Falls. Have something special to celebrate? Book a private boat tour or game drive (on request). Feeling like being a bit more active? Hop in a boat for a fishing trip. Come back to join dinner during a boat cruise and sip wine while listening to hippos and taking in the other sounds of African nature. Yes, you have arrived in a little piece of heaven, smack bang in the middle of rural Africa. Cheers to that! Please note that the accommodation rate at Chobe Safari Lodge does not include meals, drinks or activities (more information under included / excluded). All these items may be booked on the spot. 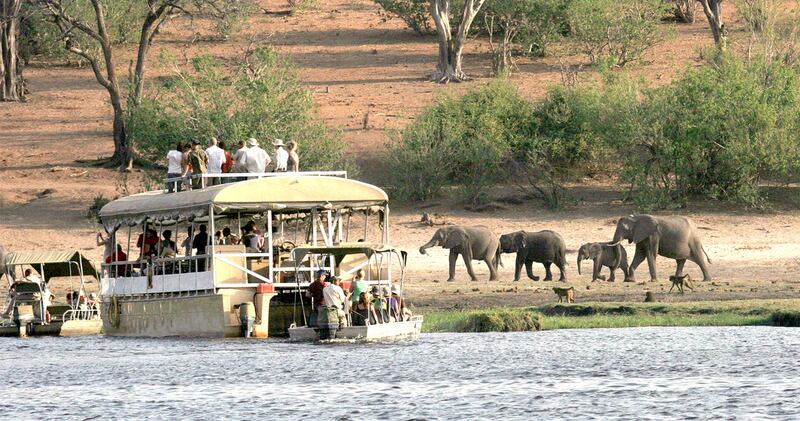 The cost for a boat cruise or game drive is approximately US$ 60 per person. You may also be interested in our 2 or 3 nights Chobe Safari Lodge packages that include full board and activities. Please make use of the contact form below for more information. Our family of 8 stayed in 4 comfortable, spacious, air conditioned roundels at Chobe Safari Lodge. 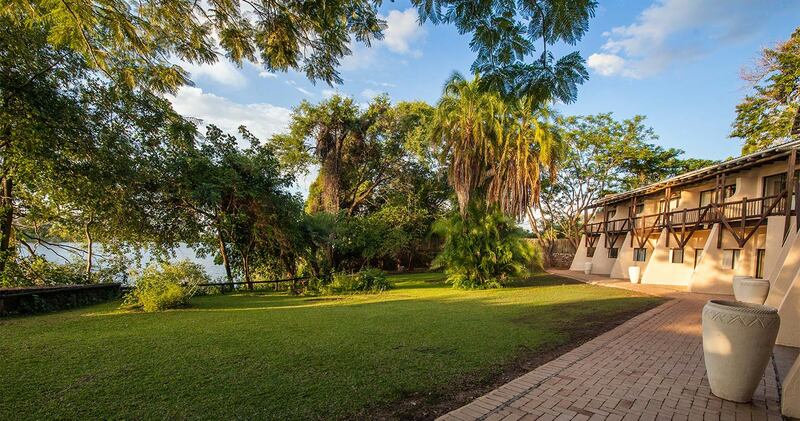 Fabulous location next to Chobe river and ideal for sunset river cruises as the jetty was located in the garden of the lodge. Restaurant was good with plenty of choices of food that was freshly cooked in front of you. Would definitely recommend this lodge. Stayed here as part of a tour and it was very comfortable and the most incredible location. There were mongooses and warthogs on the grass outside the rooms with lots of wildlife so close. The hotel is next to the river and on the edge of the national park so it is very quick to be in the wild, and equally quick to be back in very luxurious surroundings. This is in the middle of rural Africa and I felt very lucky to have such service and facilities. Chobe Safari Lodge is perfect for a family safari! Please note: Indicated price is for a 'Standard rondavel' and is on a room only basis (no meals and activities included). A single supplement may be applicable. Read all about travelling to Chobe Safari Lodge on our getting to Chobe page. Children of all ages are welcome at Chobe Safari Lodge. Children 0 - 11 years stay free of charge (only in family rooms). Twelve family safari rooms which sleep 2 children under 12 years on bunk beds; two family river rooms which consist of a main bedroom with 2 double beds and 2 single beds in a second bedroom. The shared bathroom is through the children’s room. No triples permitted in standard safari and river rooms. We hope you have found all information needed to decide that Chove Safari Lodge in Chobe National Park is the perfect place for your next travel adventure. Please fill in the contact form and we will get back to you soon!